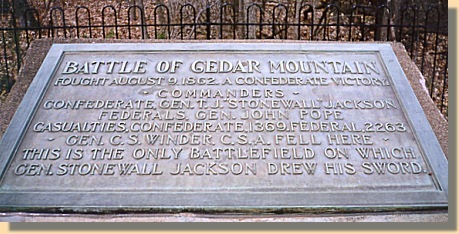 (A) The Cedar Mountain battlefield is in private hands and the only indication that a Civil War battle took place here are several roadside signs on route 15 north of Orange, Virginia. To see the roadside signs, click Here. 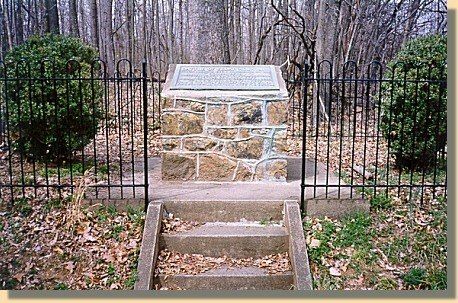 If you follow General Winder Road (left off of route 15 just north of the signs above) for about one-fourth of a mile, you see this fenced-in marker, which indicates that near here, Stonewall Jackson used his scabbard (he was unable to remove his rusted-in sword from it) to rally his troops after they were overrun by a Union flanking movement. FOUGHT AUGUST 9, 1862. A CONFEDERATE VICTORY. GEN. STONEWALL JACKSON DREW HIS SWORD.